Staying in Palermo Soho allowed me to try a bunch of new restaurants with my tour. Of course, I have a few favorites from other years that I revisited, but I don't usually stay in this area of town, so I have some new favorites! Food was not cheap, but it was plentiful. Here's Al's lunch the first day he got to Buenos Aires. I think he went there every morning for breakfast. The waitresses would tell me if they had seen him when I walked past! The waitress picture is Laura, who was there every day and enjoyed practicing her English when Spanish fell through for folks. Ninina was Jessica's favorite hangout. Again, not cheap, but wow! Here is where I learned that the Argentine word for "kale" was...ready for it? "Kale." They had amazing juices of veggies and fruit that knocked my socks off. Their coffee was great. Their salads were great. As I can't eat wheat, I have no idea how yummy all the beautiful cakes and pastries were, but they were gorgeous. Wifi meant that a lot of Argentine dot-commers were there with their computers, downing coffee and chattering away. If anyone else took pictures here, I will add them in. I guess I was too busy drinking kale, ginger and whatever else was in it, juice! I ate here last year as well, but I don't think I reviewed it. Where in the USA can you eat lunch for three hours without the waitresses trying to get you to pay and leave? I love Buenos Aires. The waitpeople were very "on" it about whether there was gluten in each item on the menu. I felt very confident that I was not eating wheat, which makes me enjoy eating out a WHOLE lot more than other places. This place has a focus on natural food. It has a huge menu of all kinds of food, which is a bit unorganized. Yummy, and halfway between our hotel and Silvana's, so it was easy for everyone. I only ate here once, but it was a favorite of the more carnivorous of our crowd (being married to a vegetarian has changed my eating habits!). Again, there was more food than should be eaten at once, but that did not seem to stop us. The waiter can recite an entire table of people's orders and drinks from memory. Impressive! We also got free champagne at the end of the meal because he liked us. This is another slide show where you need to click on the photo until I learn how to do this. Sorry! El Patio de Montevideo: yummy, yummy, yummy!! We went to this place with our friends Sara and Kent. Amazingly huge portions for great prices seems to be the aim of this place. We had sausage appetizers, salad, squash puree, rice, potato tortilla (for the vegetarian) and large steaks for three, for $51. We were too full to have dessert and could barely finish what we ordered. That is for FOUR people! Go there! Sans Armenia Tapas Bar and Restaurant: gluten free beware! This was somewhere that many of the tour members ate. They enjoyed it. I had a hard time here, as I told them I was celiac, and they brought me a meal they said did not have wheat in it. Just before I took a bite, I smelled it, and it smelled like soy sauce: WHEAT! They agreed that it had soy sauce in it and offered to replace the meal. After insisting that I couldn't eat wheat and then avoiding eating it by luck, I decided not to eat. Not a good night for me. We got off the train from Tigre very tired and hungry. We tried to eat at Sintaxis, but they were full until closing. We tried to eat at Don Julio's, but they had a waitlist. Very low blood sugar by this point (as in crying), my friends dragged me across the street to La Popular. We had a fabulously large dinner. I had a roasted chicken quarter, "rustic" potatoes and some wine, along with salad that other people couldn't finish. Yum. By the end, I felt very happy and back in one piece. Note to self: eat sooner!!! 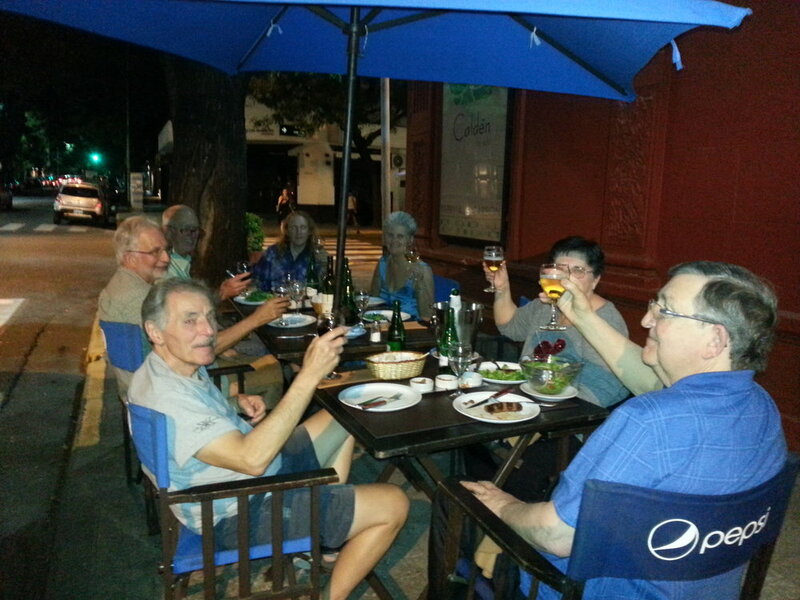 On the corner of Costa Rica and Malabia, overlooking the Plaza Armenia, MezCal was a before-dinner drinks favorite with some of the tour members. Great people-watching (and probably great food, but I never ate there) if you sit at the outside tables. When I ordered a Campari, it came in about a 12-ounce glass. Eek. As I have already waxed poetic about Sintaxis in last year's posts, I won't go on here. I ate here a few times over the two weeks of the tour, and took munchies with me each time to tide me over between trips. I tried some new meals here. The empanadas were very good. The torta pascualina was excellent. The ravioles were exquisite. I think I tried every limonada they had, with my favorite being the maracuya (passion fruit) one. I discovered that they had savory rolls and little cheese biscuits to go that were super-yummy. This was the only place where they came out with specially wrapped plates and utensils to ensure that they had not been contaminated with wheat!!!!! Those of you who are not celiac or gluten-sensitive have no idea how much this means to me. I accidentally got "glutened" at least twice during the trip, despite taking gluten enzymes at each meal. I didn't eat for about 24 hours because I was afraid to get glutened again. Sitting down to a clean plate and utensils, and a little pizzeta, made my stomach relax enough to feel hungry and enjoy eating.